The Samsung Galaxy W runs Gingerbread version 2.3.5 and, with the most recent TouchWiz launcher on board, you’ll be looking at a Galaxy S II like experience on a smaller budget. We’ve prepared a video of the device in action. Check it out below. The lockscreen holds no surprises. It can be swiped away in any direction. The cool feature where missed events (messages, calls etc) get their own unlock patterns is still here too. The homescreen accommodates tons of widgets with lots of functionality. You can have up to 7 homescreens. A pinch zoom brings you to an aggregate view of all homescreen panes, which can be edited: rearranged, deleted or added. Widgets, shortcuts or folders are pulled onto the homescreen from a drawer that appears at the bottom of the screen once you enter edit mode (press and hold on an empty spot or do Menu > Add). The app launcher is very similar to the homescreen - you can create folders to go with your shortcuts and you can add, remove and rearrange pages just like you would homescreens. You can choose List view instead of the regular grid view if you prefer. In typical TouchWiz fashion, there are four shortcuts docked at the bottom of the screen that are visible both on the homescreen and in the app launcher. You can swap the first three with different ones (by default the shortcuts are Phone, Contacts, Messaging), the fourth one being locked. It's the app drawer/home shortcut so it makes sense to always keep it in the same place. The notification area has been slightly remodeled in TouchWiz 4.0, but there aren’t any major changes to the functionality there. With the Samsung Galaxy W I8150 you get a standard Android task switcher but with one modification - it has a button to launch a task manager. The custom task manager, which Samsung have preinstalled, offers a lot of functionality. It also comes with a handy widget which shows you the number of active applications right on your homescreen. Most of the time, Android does really well when it comes to managing apps by itself (in fact, some claim that using a task manager is detrimental to the performance of a phone), so you would only need the task manager to occasionally kill a buggy app. The fast single-core CPU manages to hold its own when it comes to single-threaded benchmarks like BenchmarkPi. Here the HTC Sensation XL and XE lead the Galaxy W a bit, but they are clocked 100MHz higher. The Galaxy S II uses a newer architecture than the others and beats them despite its lower clock speed. Running Linpack in single-threaded mode sees the Galaxy W and the Sensation XL almost equal. The Sensation XE exhibits some software issues that get in the way of proper multithreading in this test. In the 3D graphics test, the Samsung Galaxy W performed surprisingly well. It left both HTCs in the dust (the XL has the same Adreno 205 GPU and the same screen resolution, so it beats us why it's almost three times slower). 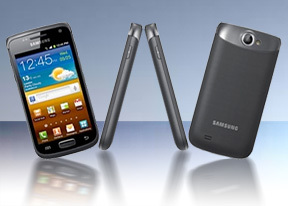 The Galaxy W even manages to get close to its high-end counterpart, the Galaxy S II, which has a beefy Mali-400MP GPU.